You've uploaded your data, but noticed that a calculation in your data is necessary? Adding two numbers, dividing a number by another number, etc. – you can do these calculations directly in Datawrapper. In step 2: Check & Describe, you can add a column based on values of other columns, similar to how you add columns in Excel. This posts explains how to use the feature. To begin with, let’s take a look at a simple dataset. We have the number of members of German parties by gender ( columns), for each of the seven parties (rows). Now how about adding a new column that contains the percentage of women for each party? 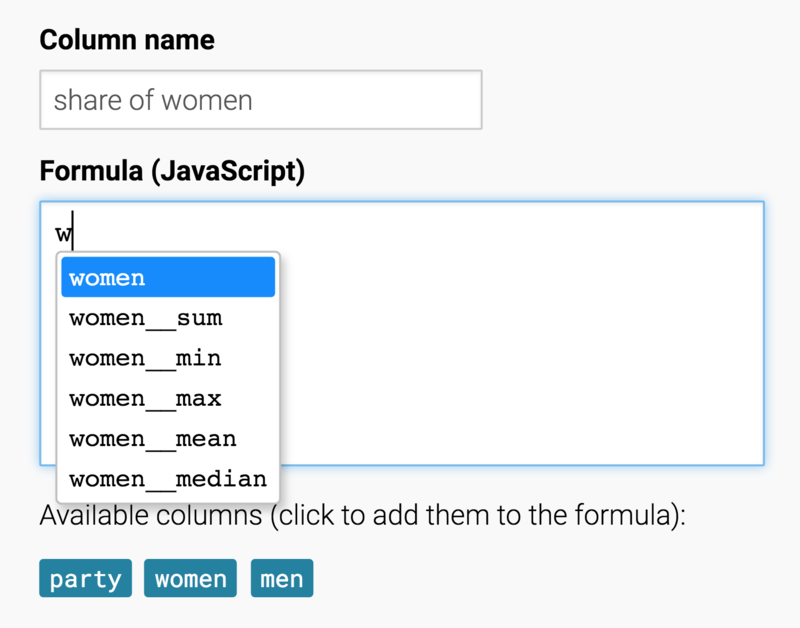 Next, you can enter the column name, for instance, “share of women“. This will be the name the column appears as in the data table and in column selector drop-downs in the chart editor. You can use any character, but you cannot use a column name that already exists in the dataset. Finally, you can enter the formula. You can refer to the values in other columns via their column name. Start by typing the first character of the column you want to address and then hit the Tab key to auto-complete. In case there are multiple columns starting with that letter you can either enter more characters or select the column from a little popup window. You can also add more than one column. Simply click the "Add column" button again.